I haven’t had the need to move an object from one schema to another in years. Really since SQL Server 2000. I wrote about deleting a user that owns a schema recently, but that’s often a first step. The next thing I might need to do is actually move objects from that schema to a new one. I actually ran across this command when I was looking how to move the schema to a new user. There’s actually a parameter for ALTER SCHEMA that will move objects. This is the TRANSFER argument and it works like this. I need a new schema for the object. 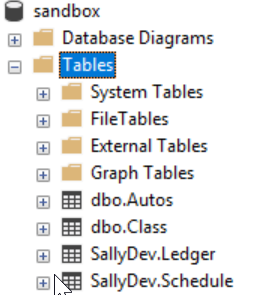 In this case, I’ve got a table called SallyDev.Class. I want to move this to a new schema, and I’ll choose dbo for this example. 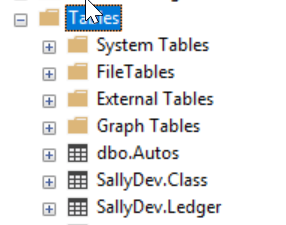 I often have had developers build in their own schema and then I’ll transfer to the dbo schema, which is almost like a merge of code from one branch (SallyDev) to another (dbo). The new schema name is just the name, with brackets if needed. Hint, if you need brackets, rename your schema, please. Now my object is moved. Success! This is a quick view of a specific skill that can be handy. I won’t use this often, but if my team worked in this flow, or we had an issue, this not only shows how to resolve a single item move, but also helps me remember the command. I hadn’t seen this before, so a quick 10 minute blog is useful. This also gives me ideas for other blogs, like how to automate this for a number of objects.